The A77 in the south west of Scotland has been classed amongst the most dangerous roads in the world, according to US researchers. In the last 10 years more than 30 people have died on the road, with nearly 250 seriously injured. The statistics have led to it appearing on a list of the world's most risky roads for Americans abroad. Local MP Brian Donohoe wants crisis talks to end the long delays in making "safer" upgrades to the road. Flyover junctions are among the measures which are planned for the Ayr to Girvan route. "The only answer to this problem is to have road separation and to have it sooner rather than later," he said. "We need to know when this programme of improvements will actually happen." His plea comes after the deaths of two teenage motorcycle riders, killed in a head-on crash on the route on Thursday. Jamie Morrison, 18, from Girvan, and Christopher White, 29, from Barr, died following the accident at the Girvan end of the A77. Dougie MacIntyre, safety campaigner and member of the local community council, added: "All too often condolences have to go out from the local community to bereaved families. "Locals are aware of the problems with the road and many are too afraid to use the junctions on the A77 simply because of the dangers. 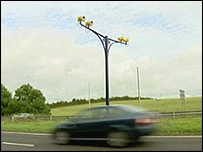 "We have average speed cameras which are seemingly making things even more dangerous as traffic concertinas from above the 70mph limit to below it." He added: "I don't think the problems on the A77 are down to speed, rather the volume of traffic shunting together because of the average speed cameras leaving no safe gaps for traffic to pull out from adjoining roads. "What we need are a series of flyovers." The A77 appeared in road warnings profiled for US travellers by The Association for Safe International Road Travel.